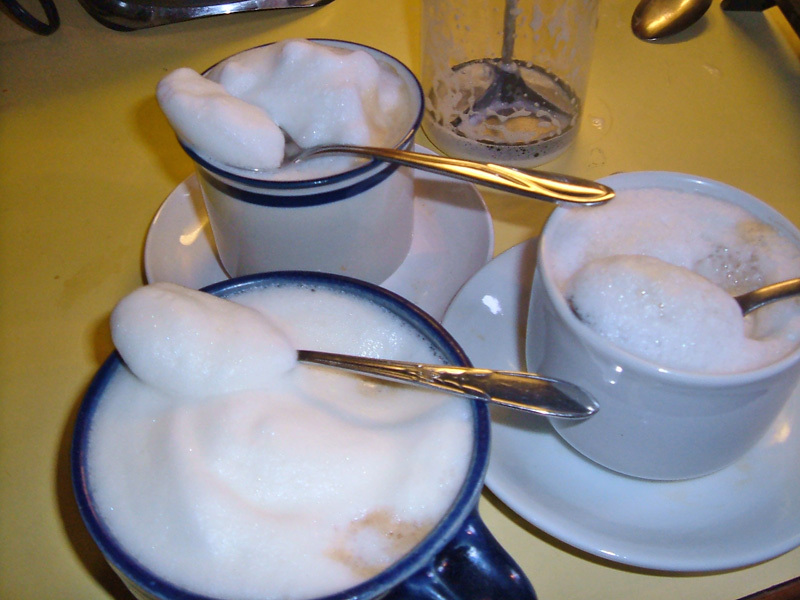 Bryanna Clark Grogan’s Vegan Feast Kitchen/ 21st Century Table: VEGAN CAPPUCCINO-- WHICH NON-DAIRY MILK FOAMS THE BEST? You may have finally convinced me to buy a soymilk maker! I'm concerned about the unfortified-ness, though, especially since I'm giving it to my kids. But I could certainly use it for my coffee and not lose out on that front. I drink two soy cappucchinos per day (made at home; my greatest indulgence) and I agree that Silk is the worst possible choice. 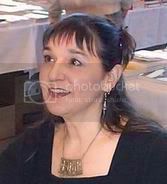 Veganmum-- check out the recipe for homemade soymilk on my webpage (link in the latest entry and on the link list at left)-- there are diretions for fortifying with calcium. I love it - your own Consumer Reports :-) You've got me craving an indulgent coffee drink right now - preferably iced since we've gone from endless rain to 91 degrees today! great experiment! your soymilk was an obvious winner! I just have to say what a fan of yours I have become. Your sites are fantastic! There is an amazing amount of information there. I exspecially like how the recipes are easy to understand and there are tips for substitutions. I am soooo loving my soymilk maker. Seriously, it is just the best. I been trying to make something new w/ the okara every time, and I just love cooking with it. And now that I am following Bryanna's methods (straining is the key!) my milk and yogurt taste even better. I used to have one of those little foamers and remember they work well, so guess that will be my new kitchen gadget of the week. Thanks for reminding me, Bryanna. I also think that you are reading my mind and it is sorta freaking me out. From the tofu feta, to the au gratin potatoes, you have been hitting exactly some of the foods I have been thinking about. Now if your next post is about fake steak au poivre . . . .
Wow, awesome! You know I always wondered whether those fomer-thingys worked with vegan milks! Have you ever tried it with vegan whipped creme, Bryanna? foamer! lol I need to check my spelling before publishing! Wow Bryanna. Great post! Do you find though that the homemade soymilk looks curdled in coffee? 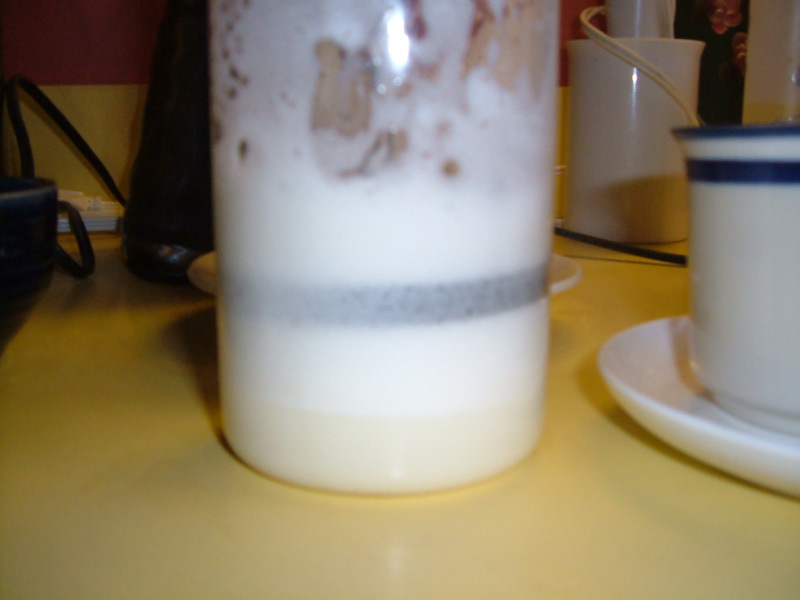 We noticed that this is the one drawback to homemade soymilk. I drink chai tea every morning, and I've found that it will look curdled in that too. 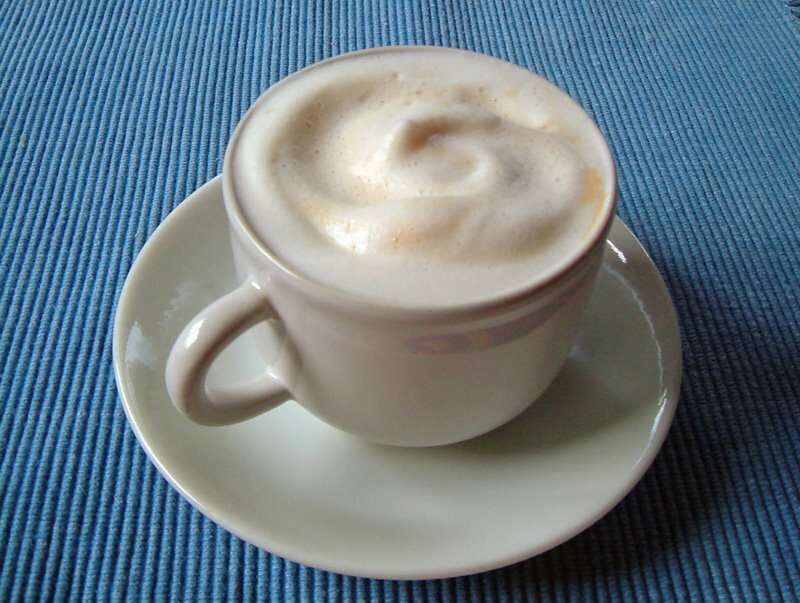 Your pics look so good I find myself craving a cappuccino now! Julie, the trick is to use dark roast coffee-- not brown beans. Dark roast actually is less acidic than the lighter roast, believe it or not! Also, there may be something acidic about the chai you drink. Warming the milk also tends to prevent curdling. I use my homemade soymilk (cold) in my (strong orange pekoe or black) tea every morning and it doesn't curdle. I use a good, smooth brand of tea, which may make a difference. And, of course, the milk is hot when added to lattes or cappuccinos. Further to the soymilk-curdling-in-coffee question, Julie, I found this on, of all things, the National Dairy Council site (! ): "...The acid in coffee, along with coffee's heat, favor curdling of cream." From Oregon State U. site; "The phenolics and acids in coffee may curdle the cream. This is especially true if the coffee is hot ..."
They also showed that a quick-brewing method (such as the steam method of espresso, or the European plunger or French press method) results in less acid in the brew. Also, oddly, less caffeine, even with the darker bean. Thanks Bryanna. We buy dark roast espresso beans (Starbucks usually) and use an espresso machine that has a steam frother on it (I'm not sure of the region of the beans). I'll have to start experimenting with it again. As for the tea, I buy loose chai tea with the spices in it from a tea shop. I usually simmer up a large saucepan full each morning and then we use it as a concentrate, adding soymilk to taste. I make it pretty strong. I wonder if I add some soymilk to the simmering chai (or a little soymilk powder) if this will cut down on the acidity, so I can add additional soymilk without it curdling? It's an interesting experiment. Thanks for your research Bryanna! Hi, Bryanna! Did you see my question in my comment? Hi, Linda! Forgot to answer you! Those foamers are only useful for hot milk. I just got one of those cream whippers with the chargers (like a siphon)-- have only just started experimenting and I'll report back! i had lost all hope of having a good cap until i read this. my husband, an omni, is all about the cap and sometimes it smells just divine. 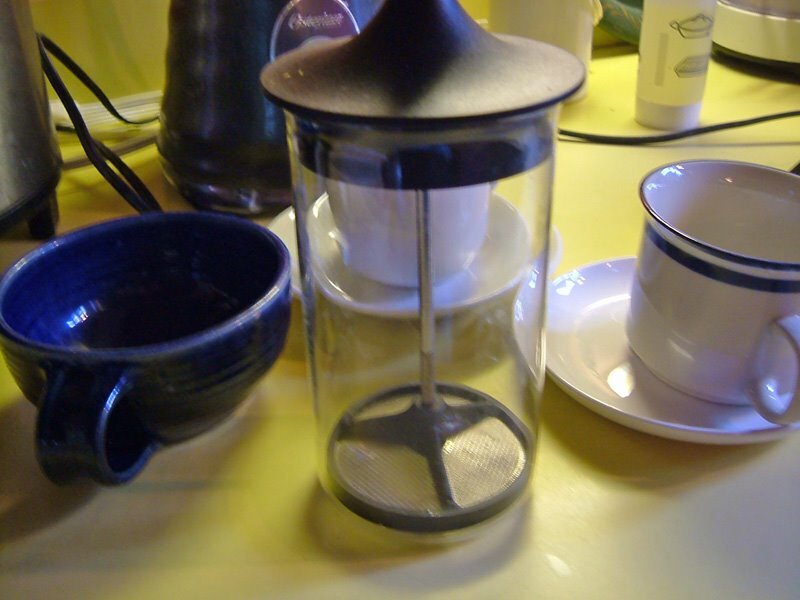 unfortunately (or fortunately, i suppose), our kitchen is too gadget-heavy and while i'd love to buy a foamer, i'm just not keen on it right now. is there something else i can use? if i do need to buy one, where can i do so? thanks for a wonderful, relevant experiment. You can buy them in any kitchen or houseware store for about $10. a bargain! This was interesting reading as I'm having some curdling issues too...my homemade soy only curdles sometimes - even when making the same beverage. I make dandelion chai and sometimes it curdles. It will either turn right away or sometimes it takes time. I have tried leaving the soy out until it reaches more of a room temperature so that it isn't such a sudden change. I even made two lots of chai in pots next to each other on the stove and one curdled and one didn't! I have also tried stirring some carob powder into fresh, warm soy milk and it curdled too. Any further ideas? Should I be careful to heat it slowly? I love the homemade soy and this is the only problem I have with it (in case it matters, I add some rapadura, liquid sweetener like rice malt, salt and a little vanilla essence to my fresh milk). Also, I wanted to say thanks for the soy yogurt recipe! What a winner!!! Fantastic consistency! 2.) Leaving soy milk out at room temp is not a good idea. Soy milk spoils even more easily than dairy milk, so you may be inadvertently causing your soymilk to become acidic! 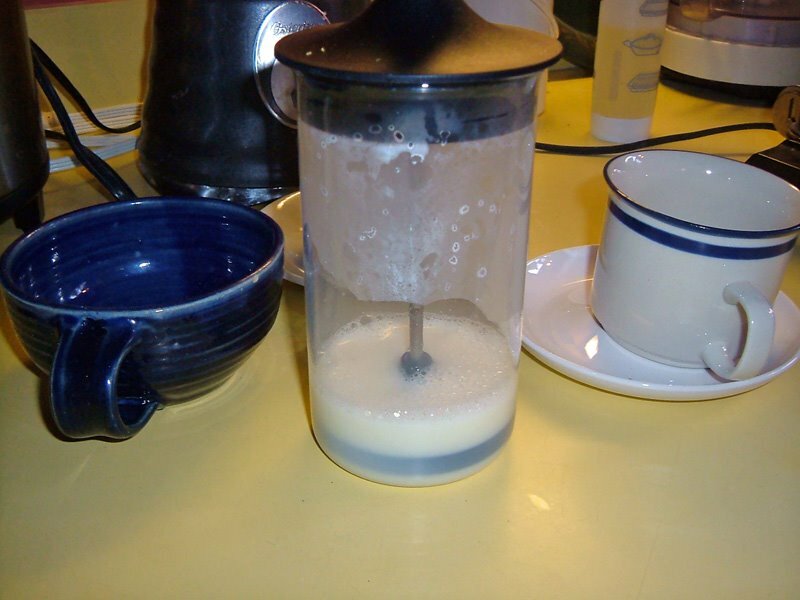 A better idea is to quickly warm your soymilk on a stiove or in a microwave. 3.) I think you have to avoid bringing the soymilk to too high a temperature, as well-- not to boiling. 4.) I have never had chai curdle my soymilk, but I use a very smooth tea, which may be less acidic. It's not expensive-- it's a common Indian brand of tea bags I get at my Superstore, Surat (Orange pekoe "enriched with Assam Teas"0-- very smooth, very aromatic, not bitter even when over-brewed. 5.) Another alternative I have used successfully is Rooibos tea, an antioxidant-rich South African herbal tea which makes a good chai. 6.) I also think it is VERY important to sterilize (scald) everything meticuloiusly when you make soymilk, to avoid stray bacteria which may cause acidity. 7.) You can use a stabilizer in your soymilk which may help if you are still having this problem-- you could just add it to the milk you use for hot beverages. (I don't like the "mouthfeel" for drinking.) That is to add a bit of guar or xanthan gum to the soymilk. 8.) Honestly, we don't do anything that special-- but I would advise trying out different brands of coffee and tea-- good, fair trade, arabica, organic dark roast beans. Not all coffee beans are equal. My husband says he's used all kinds of brands, but always dark roast arabica organic. Right now he uses Kicking Horse dark roast Nicaraguan (A Canadian local roaster). PS-- about the stabilizer in homemade soymilk-- use only 1/8 to 1/4 tsp. of the gum per 6 cup. batch. Blend it with a cup or so of the milk fuirst, and then add to the rest. I'm not guaranteeing this! About the silk soy not foaming well. I work at a coffee shop and have been for the past 4 years. I have never had a problem foaming milk to make a cap with the silk soy. You just have to do it correctly. So maybe the coffee shop you went to just doesn't know how to steam it. Don't give up on its the best!! I wanted to add this to the discussion of curdling in coffee: I've been using Paul Newman brand French Roast this week and my curdling problems have stopped. I bought his coffee on a whim. The first time I made it, I was amazed when my soymilk didn't curdle and wondered if it was because of the coffee. So I made a pot of my regular dark roast (Community, a Louisiana brand) and it curdled--same batch of soymilk. I've tested it several times, and the Newman brand never curdles. So, for anyone looking a popular brand that doesn't curdle the soymilk and is also organic, check it out. Taylor, no Trader Joe's in Canada! 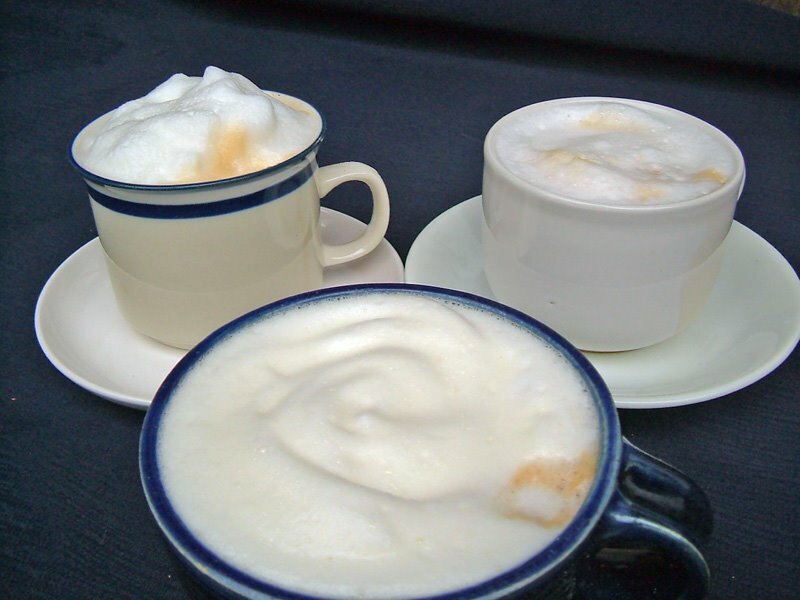 Well, soy foams the best, but you can have a delicious latte with just about any of the nondairy milks. My interest is non-Soy milks for foaming. Soy has been shown again and again to act like estrogen in the body and disrupts your body chemistry and hormones, causing you to lose muscle and add fat. Yeah, I know: it tastes the best and foams the best, but I gotta do something else! So far nut milks just don't foam well, especially in my cappucino foam attachment for my espresso machine. I was looking to have a milk frother kit or something like this because I will be giving it as a gift for my newly wed friend. Is it possible to make low acid coffee if you have stomach problems from drinking regular coffee? I must be missing something, but when I click on the link for the soy milk recipe all I get are a bunch of adds. Derm... sorry about that! I should have removed the link (and will now). That was my old website, which I haven't had for years. I use Silk original or my own soymilk now (which also has a bit of oats in it), but haven't posted my present recipe yet. I use an electric home soymilk maker, and use about 7/8 cup soybeans (which I soak overnight and rub the skins off) and 3-4 T. oat flakes per batch.